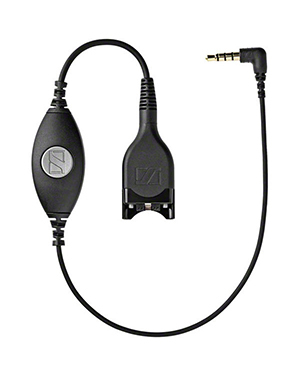 Sennheiser CMB 01 CTRL Adapter Cable is an accessory used to connected corded and wired headsets to smartphones. This adapter cable has a hook switch and a 3.5 mm jack plug. The hook switch is used to be connected to the corded headsets while the 3.5 mm jack plug is connected to smartphones. The good thing about this adapter cable is that it is compatible will all of the wired and corded headsets from Sennheiser. Call Australia wide 1300 131 133 hotline to find out more information about this incredible accessory! Sennheiser is a privately owned audio enterprise that was created by Dr. Prof. Fritz Sennheiser, who is an electrical engineer in the University of Hannover. He started the company along with 7 other electrical engineers who were working under laboratory W. The company started operating after the end of the World War II and was named was Lab W based on the Wennebostel village, which is the municipality in Wedemark where the company was moved to because of the war. Sennheiser, or Lab W as what it was known before, started out with the development of a voltmeter. From there, the company expanded to the development of microphones. And after the long run, it has also offered headphones, mixers, microphone transformers, and geophysical equipment. The company expanded more than its product portfolio since in 1955, it was already supported by 250 employees, which currently is approximately at 2,183 employed experts. It was renamed as Sennheiser Electronic in 1958. Headsetsonline Pty Ltd, the resulting division of a popular company that delivers large stack of headsets to government agencies and government sectors, is an Australian enterprise that has founded its expertise on years of experience under a top-notch company. More than just high quality devices and solutions, the company also delivers supporting services that can deal with the issues connected to the audio foundation purchased by the company. Headsetsonline also offers customers the convenience of simply ordering the products and solutions they need online for delivery. Customers won’t have to go physically to stores just to purchase the items they need form the company.